Sorry that's it for Easter ordering! Our website is now closed until Saturday 20th April. 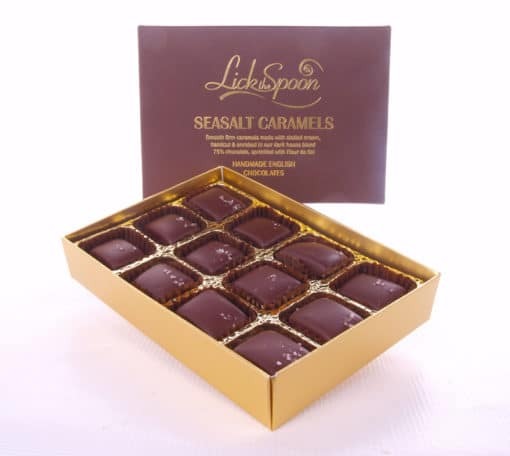 If you'd like to buy our chocolates in this period please visit our lovely stockists. Matthew & Diana and the Lick the Spoon team. A box of our new Sea Salt Caramels chocolates. These smooth firm caramels are made with clotted cream, handcut and enrobed in our signature blend 75% cocoa dark chocolate. 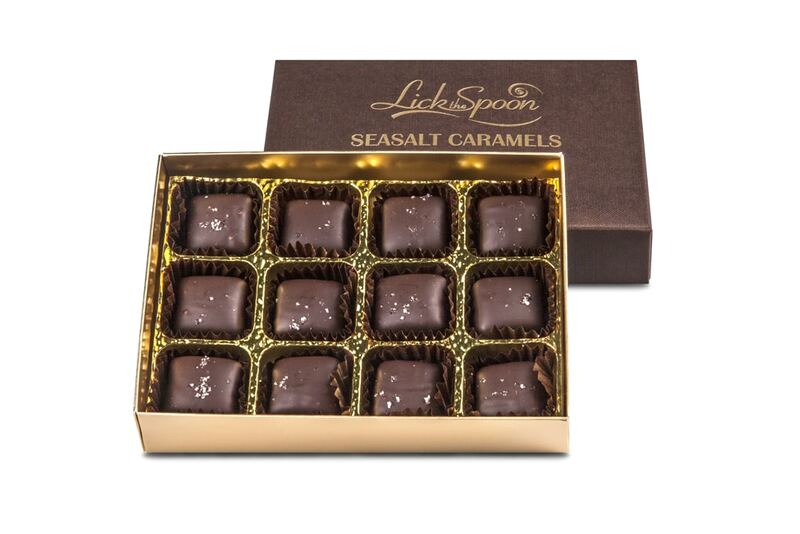 The caramels are sprinkled with Fleur de Sel. 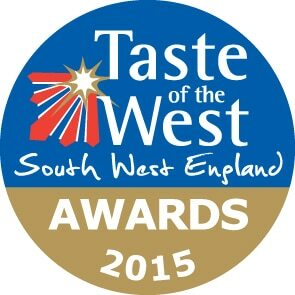 Gold Award winner 2015 Taste of the West awards. 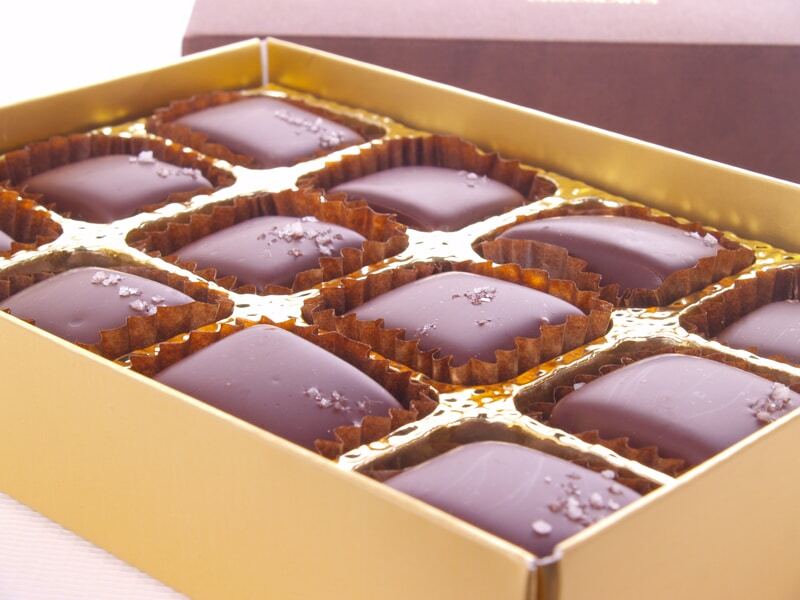 A pretty chocolate, well enrobed with a lovely smooth finish. The judges loved the little bit of salt. Just the right caramelisation and good cream flavours. Perfect with your coffee – a treat to eat! chocolate ( cocoa mass, sugar, cocoa butter, emulsifier SOYA lecithin, vanilla) clotted cream (30%)(MILK) glucose,sea salt (2%), vanilla. Made in an environment that handles NUTS, PEANUTS, SESAME and WHEAT. The lid and base are made from card, manufactured in the UK from FSC certified sources. They are biodegradable and suitable for card recycling. They use water based adhesive and do not emit volatile organic compounds in to the environment. 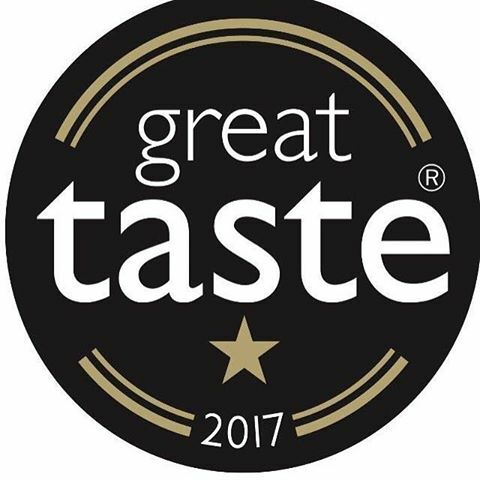 The clear bag wrapping the chocolates is made from plant material and can be home composted, put in your food waste or garden waste. It is not plastic and shouldn’t be put in your plastic recycling. We are working on a completely biodegradeable solution for our chocolate trays… but we’re not quite there yet.. The tray conforms to European (and UK) food contact legislation concerning plastic materials and articles in contact with food, including satisfactory migration testing results confirming suitability for contact with any food types. This is biodegradeable and suitable for paper recycling. The brown cardboard outers are made from FSC certified sources, are 100% recyclable and are sealed with 100% recyclable brown kraft tape. The green coloured bubble wrap we use is Biodegradable. These are made from a formulation containing a mixture of a metal ion pro-oxidant system and a biodegradation initiator. These bubble bags will promote the growth of microbial colonies to break them down over 9-12 months and is dependant on temperature and where they are stored. The process of degradation is accelerated in higher temperatures and high UV levels. It helps prevent our landfill sites being filled with polythene products that will take thousands of years to degrade ! We don’t seal the bags so please also reuse them for your own parcels. We are trialing a brown paper wrap made from recycled paper in place of bubblewrap. This can be put in your paper recycling. We use larger bubbles for cushioning. We now use a fully compostable cushion made from recycled potato peelings. This is printed on the bubble that it is made from potato peelings and can be put in your compost heap. These can be recycled in your house hold compost heap, food waste bin or garden waste bin. They are not plastic and shouldn’t be put in your plastic bin as this could contaminate plastic recycling. We use DPD Local for most of our deliveries. They are Carbon Neutral through efficient delivery vehicles and carbon offsetting. 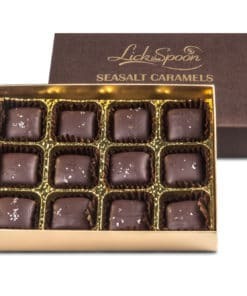 Definitely the best salted caramels i’very ever tasted! I bought these as a gift for a friend and was lucky to have one for myself in a mixed box that I also ordered. The very next day, my friend texted to say “those caramels are awesome”. She immediately corrected herself with “I meant were, not are”. I know the problem, so beware! Try, really try, to eat them slowly.